We provide extracting services for those who do not have time to process the honey themselves. Our radial extractors allow us to extract frames with less danger of blowout than tangential extractors. We charge $.55 per pound with a $25 minimum charge. The honey that you receive back comes from your own hives. Please call before you come out so that we may be ready for your arrival. Your supers need to be free of bees and brood. We use a commercial grade mechanical uncapper—A Cowen Silver Queen that uses a pair of hot vibrating knives to uncap with. Although uncommon, warped or damaged frames may not feed well through our machine and may need to be uncapped by hand. Our extracting rates are set at 55 cents per pound. 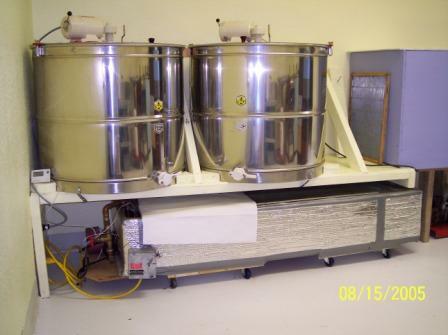 We can filter your honey as well and have it completely ready to bottle for 20 cents per pound. Because we have to clean out the extractor and uncapping machine between batches, we have set a minimum charge for extracting services at $25. If you have 50 pounds of honey to extract, this will cover that cost and you will be charged at the per pound rate. If you bring us only one frame containing a pound of honey the charge will be $25. We also can filter your honey into a bottling bucket. This makes it more convenient for you to bottle your product. Bottling buckets cost $30.75. We buy cappings for $5 per pound if you have no need for them. As part of our extracting services, we also repair frames and boxes. Generally, a simple frame repair to reattach a loose joint requires only a shot or two from our pneumatic narrow crown stapler. Our charge for frame repair is $1 each. Combs and boxes should be free of bees and most importantly free of brood. 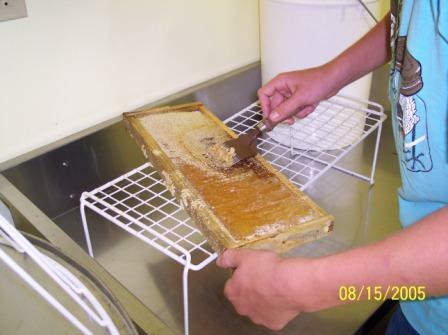 Any frames containing brood are not run through our uncapping machine and must be uncapped by hand. Frames containing brood will be uncapped by hand and an extra expense of $1.50 per comb will be charged. We can hive your packages of bees here in our own starter yard. We started offering this service several years ago to beekeepers who were out of town or away on business during the package arrival time. You may bring your hive to our yard prior to the bees arriving as a single deep box. We will install your package, release the queen, and have the hive ready for pickup 2 weeks after hiving. As many beekeepers understand, hives should not be transported or radically disturbed for a couple of weeks after the new queen is released. It is possible to transport hives prior to this but queens are not guaranteed under this situation. Your equipment should be in good serviceable shape and be able to be made bee tight for your return trip. Hiving with a caged queen is $10/hive. We can release the queen for $2.50/queen, and feeding is $5/week. If you don't have an existing hive, we offer starter hives for $135/each, which include a bottom board, a complete brood box with 10 frames of comb, a frame feeder with cap and ladder, an inner cover, and a lid.